In the third of a three-part series, CFO of the Year Michael Rousseau details the consolidation of the national airline’s procurement and the introduction of Rouge. 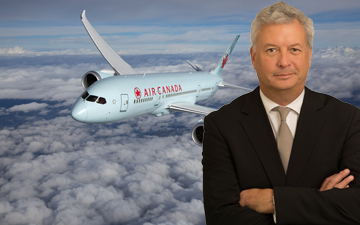 OTTAWA – Michael Rousseau, CPA, CA, executive vice president and chief financial officer of Air Canada Corporation in Montreal, has presided over a remarkable financial turnaround at Air Canada since 2007. Rousseau says the national airline has made significant changes to improve profitability, including the consolidation of all procurement resources, with the establishment of a single department with responsibility for negotiating agreements with suppliers. “The ability to leverage our total size and a better go-to-market process has resulted in annual cost savings of specific supplier contracts of at least 10 per cent or approximately $50 million per year,” adds Rousseau. In 2015, according to Air Canada documents, the SM team executed 156 agreements totaling $1.2B in spend with savings of 9.9 per cent over the term of the agreements, significantly expanding margins. Profitability was also increased through the introduction of Air Canada Rouge, a lower cost leisure airline service for vacation passengers, which was launched in 2013. “Rouge has done very well for us. It has allowed us to maintain existing leisure routes and also opened up growth opportunities for flights to leisure markets because the cost of the aircraft is much more competitive. The Rouge aircraft has a lower unit cost; therefore we can offer a very competitive fare to the vacationing customer and still earn a reasonable return on investment,” Rousseau elaborates. In the first quarter of 2017, Air Canada has hit some turbulence, posting a $37-million loss due to a 16 per cent increase in operating costs resulting from higher fuel prices and other items. The loss was equal to 14 cents per share. Air Canada made a $101 million profit in last year’s first quarter. Rousseau joined Air Canada in October 2007. Significantly, he came from the consumer business sector, where he was President of Hudson's Bay Company (HBC), which he joined in 2001 as executive vice-president and chief financial officer. Rousseau played a significant role in the sale of the HBC while under the threat of a hostile takeover bid from Maple Leaf Heritage Investments, a Nova Scotia-based subsidiary of B-Bay Inc., owned by an American billionaire. Montie Brewer, then President and CEO of Air Canada, said "I am delighted to welcome Michael aboard Air Canada in this key financial role as we continue to work towards creating a sound foundation for the airline's sustained profitability. His proven abilities will further strengthen the management team and will accelerate our focus on delivering shareholder value." Jeff Buckstein, CPA, CGA, is an Ottawa-based business journalist. With files from Canadian Accountant.